(Sega Channel) 1995-06? ¥? ? Pitfall: The Mayan Adventure (ピットフォール) is a platform game developed and published by Activision in 1994. It is part of the Pitfall series, and is notable for being one of the few games to be released on both the Sega 32X and Sega Mega-CD Sega Mega Drive add-ons, as well as being a stand-alone title for the standard Mega Drive system. In the game the player controls Pitfall Harry Jr., the son of the hero from the first game(s) who must rescue his father. The original Atari 2600 Pitfall! game is also hidden and can be played. Controls can be configured. The game supports the 6 button controller. shoots the selected weapon, jumps and is for a physical attack. , and can be used to access rocks, boomerang or smart bomb respectively. On a 3 button controller, cycles through available weapons. Holding pressed for some time pauses the game. Pushing and together makes Harry Jr. crawl. Levers are used by pushing . All stages contain a magnitude of secrets to collect, including hidden letters that for the word "Pitfall". 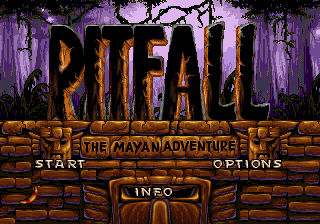 Pitfall: The Mayan Adventure was one of three Super NES games announced by Activision during 1993 based on its older Atari 2600 back catalogue. All were stopped mid-production presumably due to quality concerns - the others; River Raid: The Mission of No Return (based on the 1982 game River Raid) and Kaboom! : Return of the Mad Bomber (based on the 1981 game, Kaboom!) were not released, while Pitfall: The Mayan Adventure was delayed by a year and given a complete graphical makeover. The lead platform also transitioned from the Super NES to the Sega Mega Drive. Animation for Pitfall: The Mayan Adventure was created by Kroyer Films (of FernGully: The Last Rainforest fame). Outlines of characters were drawn by hand on paper, and then sent to Activision for scanning, colouring and editing. Bill Kroyer claims to have no knowledge about Disney's Aladdin, which pioneered these techniques during 1993. One weird thing is that the Nordic rental version had different artwork. The hero is almost the same but under him you'll see two crocodiles. Pitfall: The Mayan Adventure was also released for the Atari Jaguar, Super NES, Windows and later, the Game Boy Advance. The Mega Drive version has since been released on the Wii's Virtual Console service. While the 32X version of the game has a larger color palette, it is let down by slower framerates for the foregrounds and sprites, due in part to the system's inability to draw its high colour graphics as fast as its 64-colour Mega Drive counterpart (which incidentally is still responsible in this case for the backgrounds, which update at the full 60FPS). The Mega-CD version, as well as including a CD audio soundtrack, contains full motion video sequences and extra stages. Compared to the 32X version, it runs stable. The Super NES version has brighter, more balanced color palette, but technical issues such as slowdown, missing animations etc. The "definitive" version is a tie between the Mega-CD, Jaguar and PC version. The extra stages in the Mega-CD version are located after the nightime jungle stage. They were meshed into the game and don't require any special method to be accessed. These stages mainly reuse graphics instead of having newly drawn ones. Difficulty wise, they compare to the end game stages of the regular version. Main article: Pitfall: The Mayan Adventure/Magazine articles.